Near Durness the small brook has dug deeply into the landscape before the sea mouth. 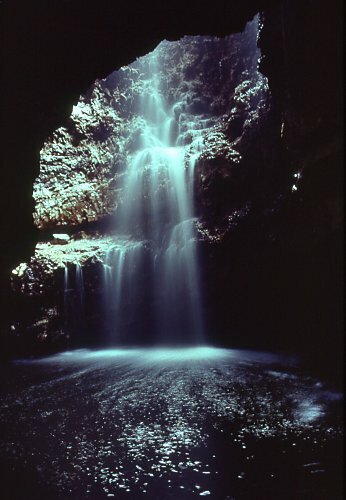 Suddenly the stream disappears of the surface and falls in a hole into the 'Smoo Cave'. The cave is short but the halls are very impressive. The fantastic nature background reminds of a pirate's hiding place. But whether it was truly once one? PS: in the summertime the little brook dries up quite often. Therefore the experience of the phenomenal water curtain depends a little bit of luck.